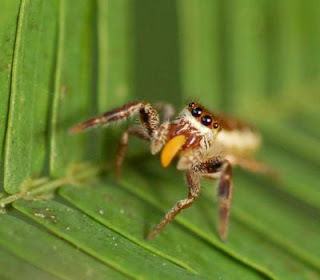 I just love this cute picture of the new spider, Bagheera kiplingi. Insects have a variety of methods for surviving the coldness of winter. Migration is one strategy for escaping the killing temperatures. The Monarch Butterfly is the foremost example of this maneuver, but other insects migrate into northern areas from the southern states in the Spring. Crop pests are the most obvious of these migrants. Overwintering as Larvae. Many insects successfully pass the winter as immature larvae. The protection of heavy covers of leaf litter or similar shelters protect the woolly bear caterpillar, while other insects replace the water in their bodies with glycerol, a type of antifreeze! Some grubs simply burrow deeper into the soil to escape the cold. Overwintering as Nymphs. Not many insects are active in the winter, but the nymphs of dragonflies, mayflies and stoneflies live in waters of ponds and streams, often beneath ice. They feed actively and grow all winter to emerge as adults in early spring. Overwintering as Eggs. Lesser numbers of insects lay eggs which survive the winter. The most prominent insects in this category are Praying Mantids, and the destructive Corn Rootworms also engage in this strategy. Overwintering as Pupae. Some insects overwinter in the pupal stage, then emerge as adults in the spring. Moths in the Silkworm Family, Saturniidae, may be found attached to food plant branches as pupae in the winter. Hibernation as Adults. Many insects hibernate as adults. Lady bird beetles are a well-known example, and are sometimes seen in great numbers in the fall as they congregate at high elevations. Many large wasps seek shelter in the eaves and attics of houses or barns. Tree holes, leaf litter, and under logs and rocks are common shelters for overwintering adult insects. The Mourning Cloak Butterfly is usually the first butterfly that is noticed in the Spring, and this is because it hibernates in tree holes or other shelters during the winter. As in some insect larvae, it reduces the water content of its body, and builds up glycerol which acts as an antifreeze. Honey bees stay in hives during the winter, and form clusters when temperatures fall. They also are able to raise the temperature by vibrating wing muscles. In general, insects are able to survive cold temperatures easiest when the temperatures are stable, not fluctuating through alternate thaws and freezes. Many insects can gain shelter and nourishment through the winter in a variety of micro-habitats. Among these niches are under the soil, inside the wood of logs and trees, and even in plant galls. One kind of fly is known by fishermen to be present in certain galls in winter, and the fly larvae are consequently used as fish-bait. Blankets of snow benefit insects by insulating the ground and keeping the temperature surprisingly constant. Honeybees have been studied during the winter and are found to remain semi-active in hollow trees through the generation of body heat. The consumption of up to 30 pounds of stored honey during the winter months makes this possible. Heat energy is produced by the oxidation of the honey, and circulated throughout the hive by the wing-fanning of worker bees. Insects that are inactive during the winter months undergo a state in which their growth, development, and activities are suspended temporarily, with a metabolic rate that is high enough to keep them alive. This dormant condition is termed diapause. In comparison, vertebrates undergo hibernation, during which they have minor activity and add tissues to their bodies. 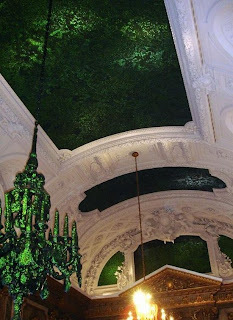 This ceiling truly is delightful! 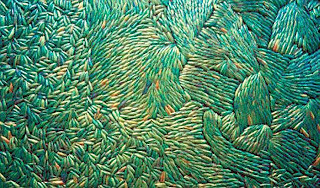 Entitled "Heaven of Delight", Belgian artist Jan Fabre has created "murals" out of Jewel Beetle elytra (the hard part of a beetle wing)! 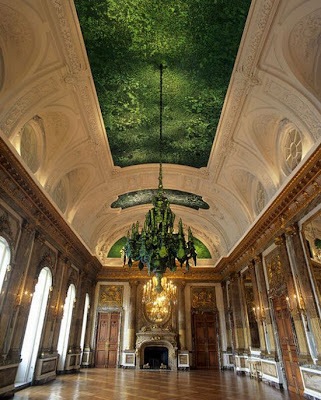 Over 1.5 million beetle wings have been used to cover the ceiling panels and chandelier in the Belgian Royal Palace. 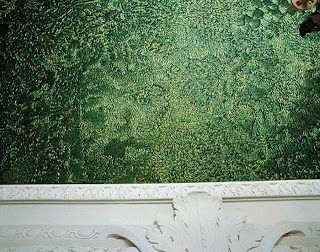 Although he had several full-time helpers, this work still took months to install! This gives me a lot of hope that my own personal creations made with beetles will last for many years to come! 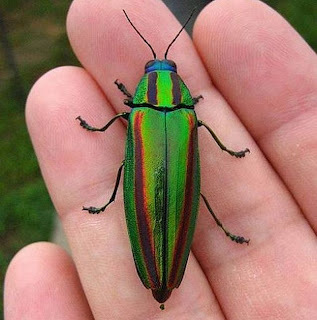 Apparently these beetle elytra come as a by-product of the Thai food industry. The rather large beetles are used as food, and the wings are thrown away! I just love the originality and the beauty of this work! Enchanting!